IIT-JAM also knows as the exam Indian institute of technology- joint admission exam for all BSc student who want to admission in IITs for their M.Sc. if any BSc qualified candidate want to admission reputed IIT’s need to qualify this IIT-JAM exam. 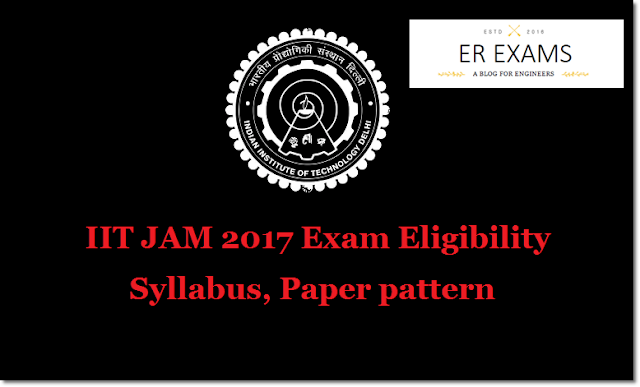 Before starting we all want to you about eligibility for IIT-JAM exam 2017. If any students who pass their BSc degree can give IIT JAM 2017. Many of student search in net eligibility for this exam so my friends here I come with this this exam eligibility criteria. A candidate is required to qualify in the corresponding Test Paper and also satisfy the Minimum Educational Qualifications (MEQs) and Eligibility Requirements (ERs) of the respective Academic Program. The students should at least score 55% aggregate marks for General/OBC category candidates and at least 50% aggregate marks for SC, ST and PD category candidates in the qualifying degree. Here I am provide some date for the it jam exam 2017 if you prepare for this exam you want to know these date. In future I provide more information about this exam so my friends still contact with my blog erexams.com. My next post I provide detail syllabus for this exam. To begin the journey you can ink you learning path with the clearly defined IIT JAM 2017 Time table for Important Dates and Notifications. If You Like This Post Share With Your Friends….